Food production is the biggest impact we have on the planet, yet we waste 1/3 of all food globally. We’re proving that the solutions can be fun and delicious. We brew award-winning beer with surplus fresh bread from bakeries and sandwich makers that would otherwise be wasted. All profits go to the charity Feedback who campaign against food waste. 44% of all bread baked in the UK is wasted throughout the value chain. In concrete numbers, 900,000 tonnes of bread per year (24 million slices) are discarded by households which makes up about half of bread waste. That’s a huge waste of the land, energy, fuel, and human capital that goes into producing the bread. We take the heel end of loaves that would usually be discarded by sandwich manufacturers and use it to replace 1/3 of the virgin malted barley that would otherwise be used in brewing. The only other ingredients are (locally grown) hops, yeast and water. In our first 18 months, we’ve used 9 tonnes of bread, equivalent to 4.3t CO2e. There is a huge amount of surplus bread – every bakery has some surplus – however there would be a huge logistical challenge to sourcing it. We therefore work with a single sandwich maker for our bottled beers. 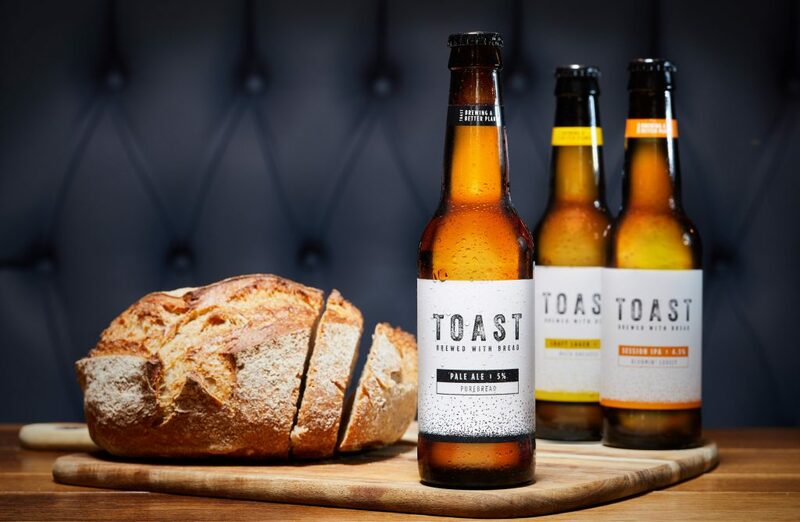 To tackle bread surplus at a local level, we have published a homebrew recipe that people can use to brew their own Toast, and we encourage brewers and bakeries to work together with us on collaborations. We are very strict on quality control, so can only work with bread suppliers who are able to completely segregate and maintain the quality of their surplus bread. Financially, we incur the cost of brewing upfront but don’t receive payment from our customers immediately. We manage working capital by very careful stock and sales forecasting. Contract brewing also helps us to work to flexible schedules to meet demand.